Circus Entertainment, Circus Shows, Acts and Artists for events worldwide! At Bigtopmania we aim to provide quality affordable Circus Entertainment, Circus Show, plus Acts and Artists for all occasions. 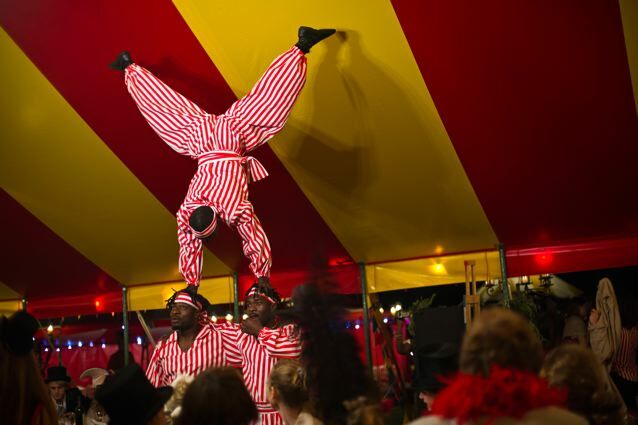 Circus shows are performed in our circus tents but we are equally comfortable at indoor or outdoor locations. We tailor the show to fit your theme and budget, working with you to create high impact circus entertainment that will amaze your guests and provide a focal point for your event. Shows can last from 10 minutes to 1.5 hours and could be a one man show or a full cast of circus performers. It all depends on what your trying to create and that is why each event is considered carefully as no two events are the same. A sample video of one of our shows can be seen below this uses a cast of just 5 performers. But why stop at just watching the circus, time to get involved. Bigtopmania have all the resources to provide a full day of circus theme entertainment, think beyond just circus skills which is a given that we provide that, but aiming to give you something slightly extraordinary; think knife throwing, trapeze workshops, trick rope lessons, crazy bikes and tight wire sessions. The video below is a good example of a circus day that we provided to a large company for a conference weekend. You can read all about what we supplied in this article. Private circus theme birthday parties are often in the London area, Surrey, Essex, Sussex and the Home Counties’ areas but we take them all over the country too from our base in the South West UK. We work in all sorts of situations and at all kinds of events and have a large range of resources and lots of great artists from which we can produce tailor-made, bespoke packages. Children’s circus parties might have a focus towards making the birthday child the star of the show, along with others. Plenty of clowning around with enough circus magic to wow the parents as well. Not many circus performers can provide the full package of a circus show in a big top that comes in a range of sizes, some of which are small enough to fit into an average size garden (or if not, a local cricket club) Check out this top notch London circus party here. Don’t let the kids have all the fun. We do circus parties for adults too! This category includes 18th’s, 21st’s, and all the proper adult parties as well. Circus is a fantastic theme to get everyone dressed up and looking glamourous. No better way to set the theme off but with real circus performers in a circus big top. Circus performers can perform in any venue whether you have a big top or not, their skill and dexterity will astound your guests and help break the ice in the early stages of a party. For a full-page of Circus shows ideas and photos of some of what we’ve done, go to the full circus show page. High energy incredible acrobats. Our very good friends from Ghana!